I love staining wood. It is such an easy way to give a piece more depth or to add a classic touch to a piece and make it look more expensive. 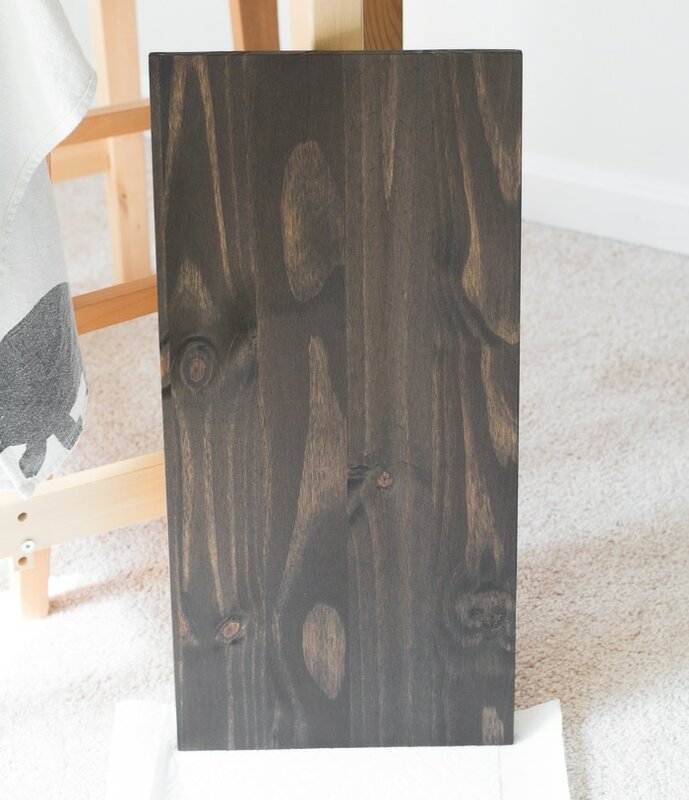 For example, the piece I’m working with for this post will be the new top to an Ikea dresser. Major upgrade! And the process isn’t as difficult as you probably think it is, either. 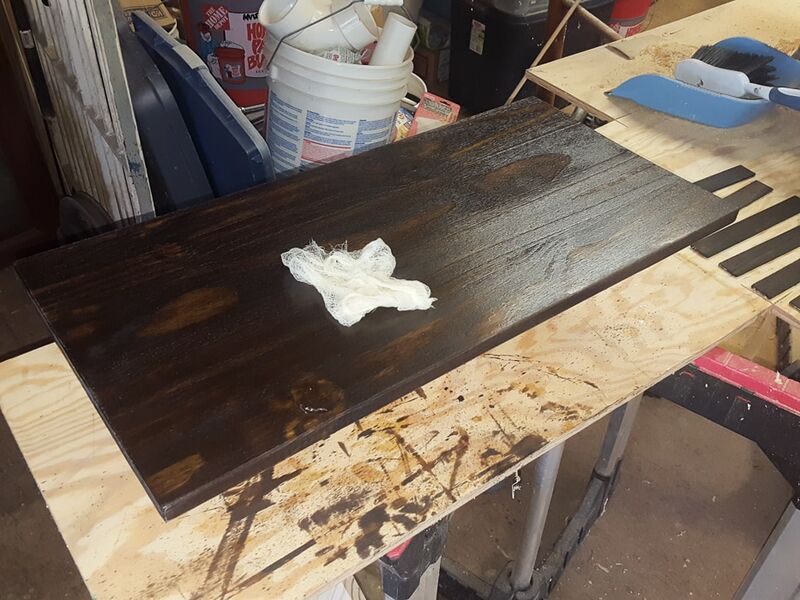 I was intimidated when I first started learning how to stain wood, but I actually think staining is an easier process than painting. 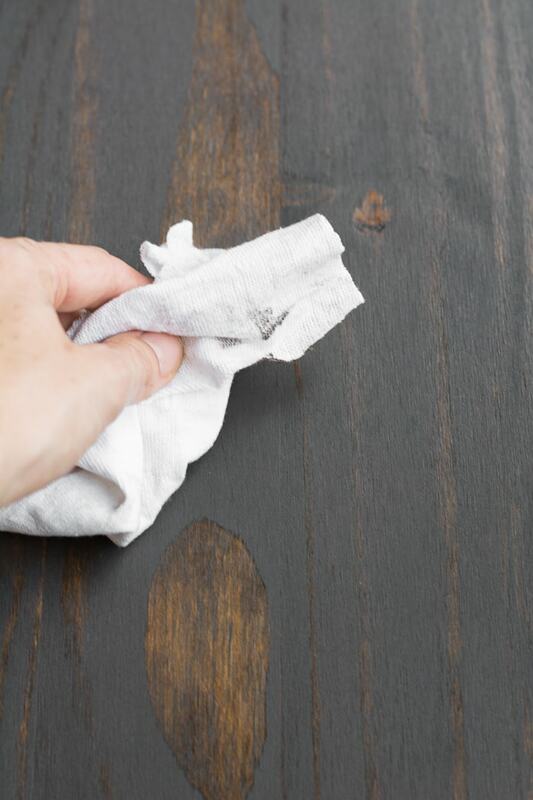 Applying stain is so forgiving–you don’t have to worry about brush strokes because unfinished wood is going to soak in your stain however it wants to soak it in. 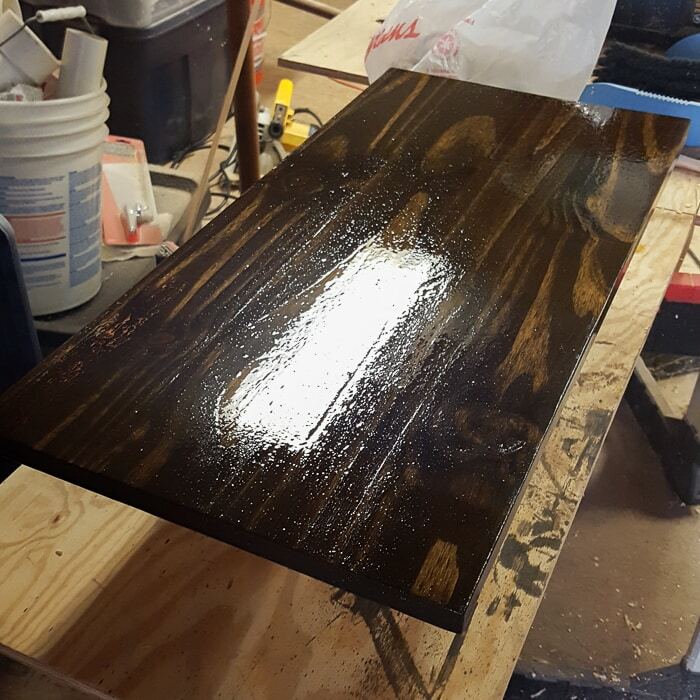 Applying polyurethane after staining is a little trickier, but the ability to sand out issues and apply multiple coats makes it pretty forgiving as well. 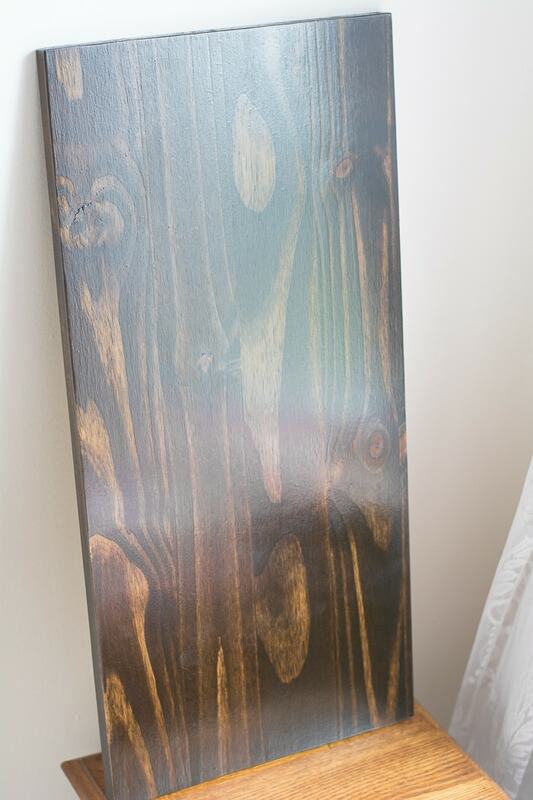 So if you want to learn how to stain and finish wood, sit down and start taking some notes! 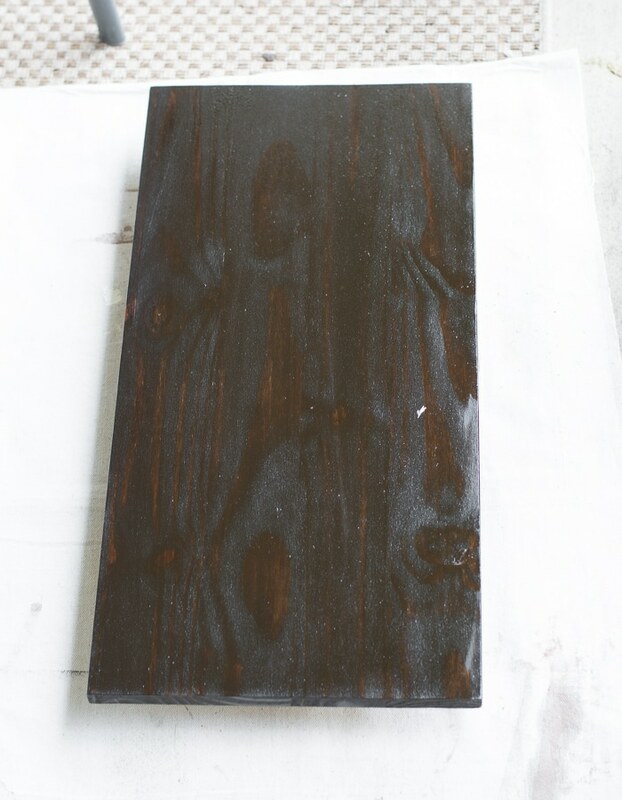 Minwax wood stain in Ebony. You can see other colors here. I like to Google the color to find finished pieces photographed in different lights. 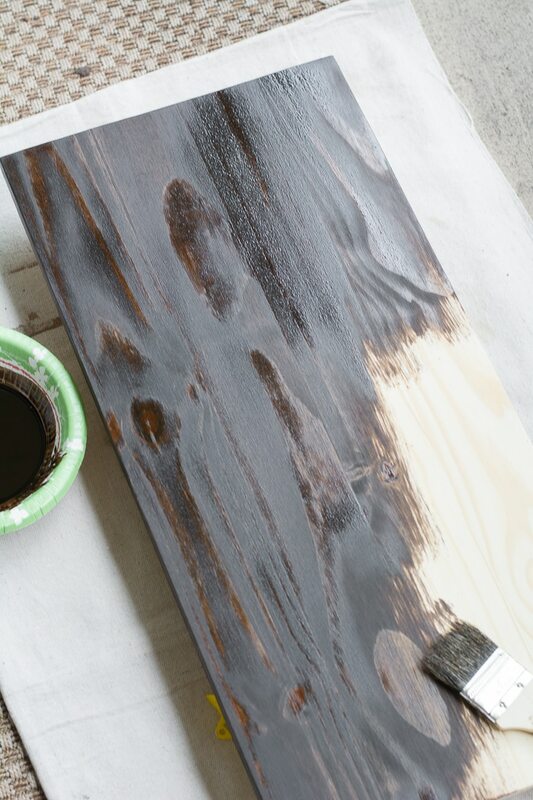 Remember that different woods will each take on stains a little differently, so just be flexible! Tack cloth, a rag, and a disposable brush. You want a cheap brush for oil-based paints so you can throw them out when you’re done. You don’t want that stuff going down the drain. The piece of wood I’m working with for this tutorial is unfinished. That means that it has no primer, paint, or finish of any kind on it. 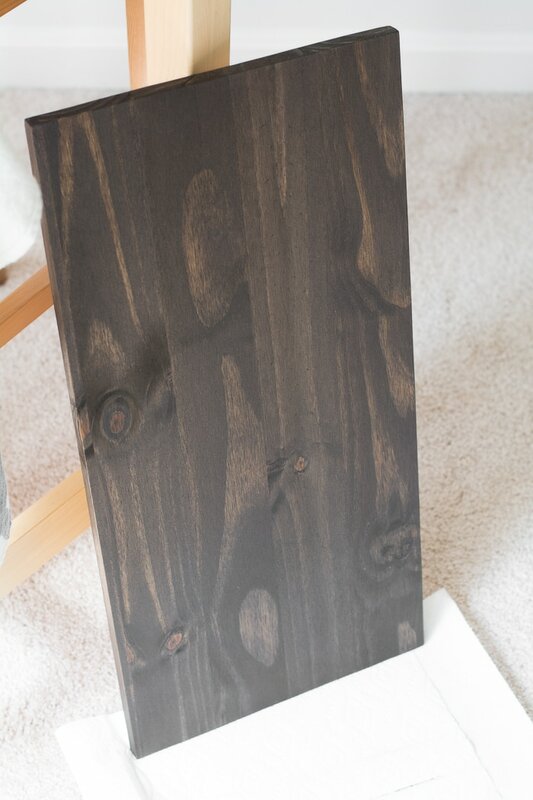 It’s okay if you want to stain a finished piece of wood…you just have to sand everything off first! Wood must be unfinished to be stained. If it isn’t unfinished, the stain won’t be able to soak into the wood. You can use an electric sander, a handle hand sander, or even just a piece of sand paper. Sandpaper comes in grades (or grits). The higher the number, the finer the grade. 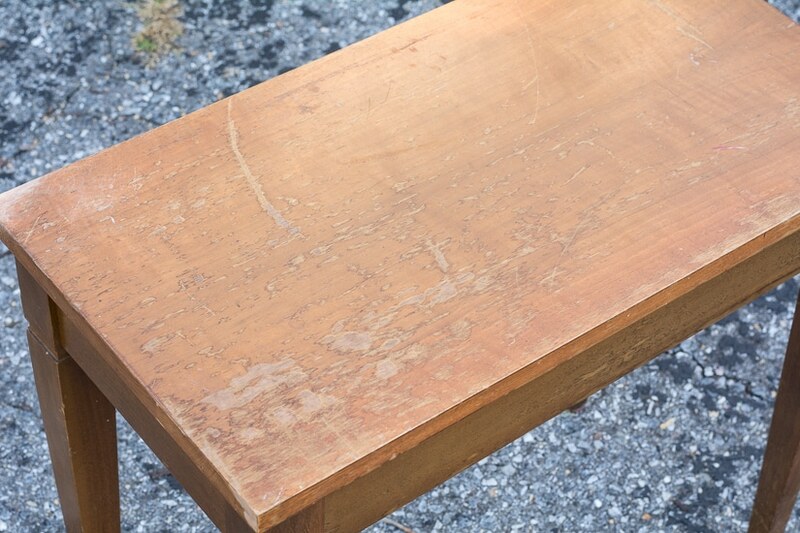 Medium grits are typically best for removing finishes (#120 and #150), and very fine grits (like#220) are used to buff a piece of wood before sanding or between finish coats. As you’re sanding the finish off, use a dry paint brush to brush the dust off every few minutes to monitor your progress. When you’ve removed the finish completely, brush off the bulk of the dust and wipe down the entire piece using tack cloth. Below are before and after photos of a bench I used an electric sander to sand the finish off of. In the second photo, I had completely finished sanding down the top, but I only gave a light sand to the body since I wasn’t staining that part–just painting it. 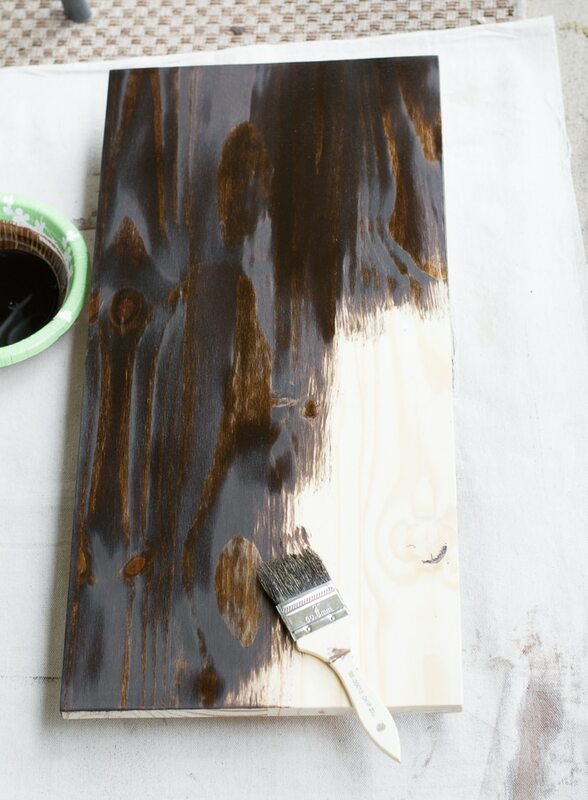 Now that you have an unfinished piece, you’re ready to stain. Step 1: If you didn’t have to strip a finish off of your piece, go ahead and use a fine grit (like#220) sandpaper to polish your piece. Break down the edges for a more finished look. Then, using tack cloth, wipe down the piece to remove any small pieces of dust. Make sure you apply your stain (and polyurethane) in a well-ventilated area. You don’t want to be trapped in a room with this stuff! 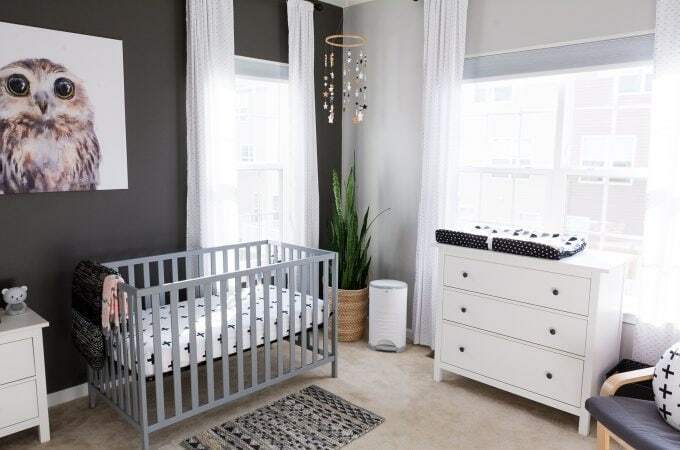 Step 2: When you’ve finished painting the stain on, let it sit for 5–15 minutes to soak in, then grab your rag and gently wipe the piece down. This removes any excess stain. Add a second coat if you’d like the color to soak in a bit more. After this, let the stain dry for about 24 hours (up to 48 hours if you’re working in a super humid environment). Step 3: After the stain has dried, it’s time for the first finishing coat. 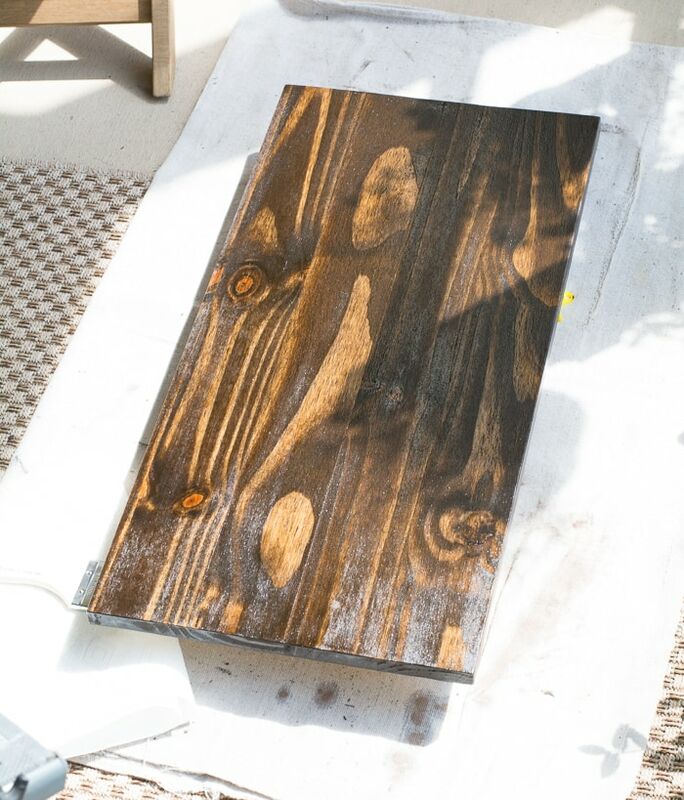 Remember, you put the stain on unfinished wood, so you need to seal the stain to protect it. Open and stir your polyurethane then brush a coat on. It will bubble as you brush it on. That’s okay, just slowly brush over the bubbles to smooth them out. Many of the bubbles will also pop as the finish dries. Again, watch for side drips! 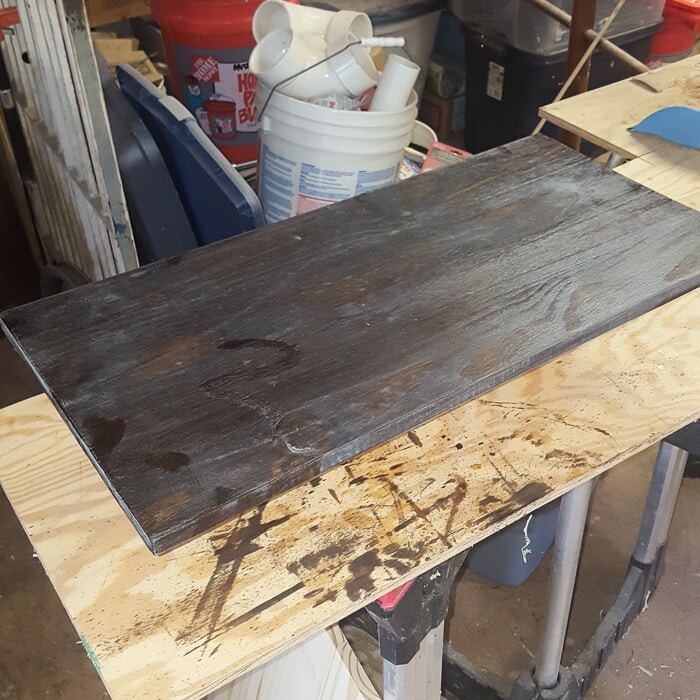 Step 4: When the first coat of polyurethane dries, grab the #220 grit or higher sandpaper and very lightly do a quick sand over the entire piece. This will smooth out the surface and get rid of the bubbles that didn’t pop when the first coat was drying. Use your fingers to feel the surface before and after sanding to see the difference. Step 5: When you’re done sanding, wipe down the piece with your tack cloth and apply a second coat of polyurethane. Two coats is often enough, but you can repeat step #4 and do a third coat if you’d like. I did a third coat on my piece because I am popping this on top of a little Ikea dresser and expect it to get a decent amount of traffic. And that’s it! Isn’t it pretty? 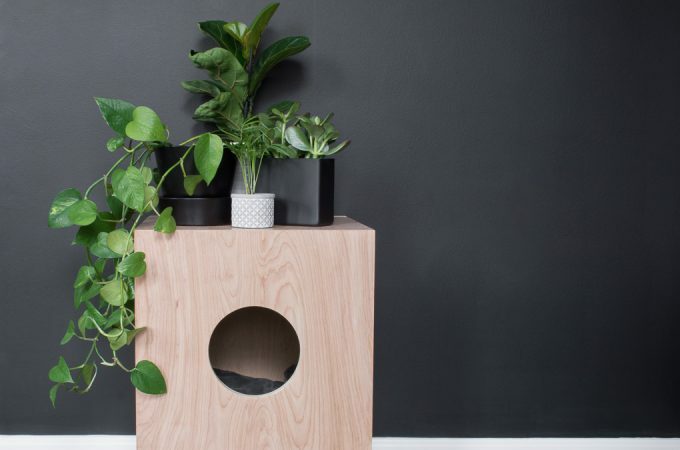 It’s such a nice way to upgrade a low-end piece of furniture. 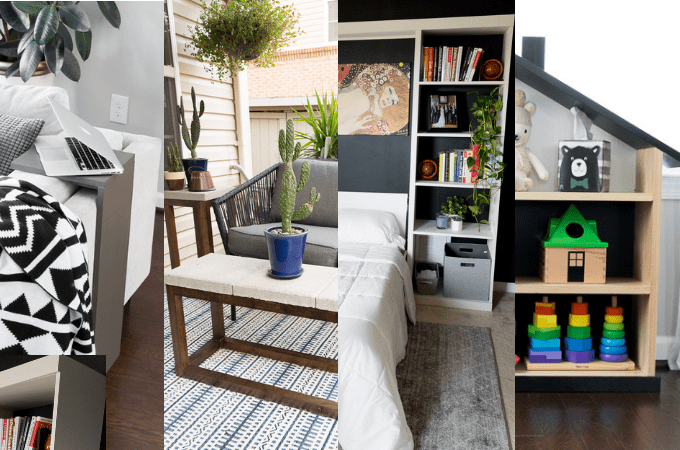 I’ll be sharing my upgraded dresser in a few weeks, so stay tuned for that! In the meantime, HAPPY STAINING!! Thank you, Angie!! Me too. But the result in the end is worth it! Some hardwoods will “close up” and hardly except your stain if you sand all the way to 220 grit. With those you would be better off to stop at 120 or 150. The polyurethane with smooth it out further as you apply additional coats. 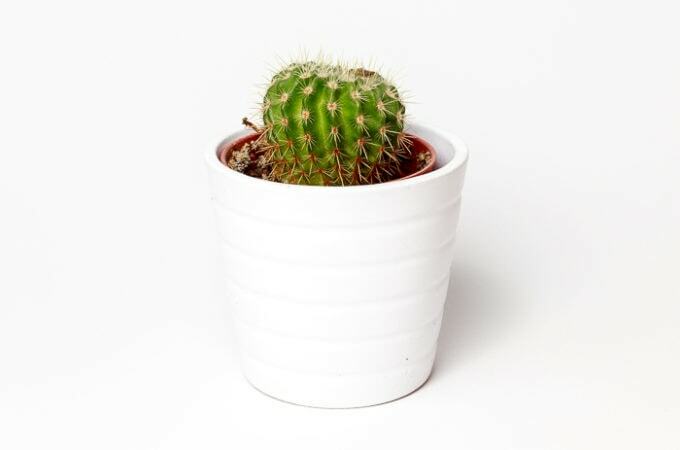 Some soft woods, such as the less expensive pine you buy at the box stores can become blotchy after you stain them. To avoid or lessen this effect you can use a wood conditioner. 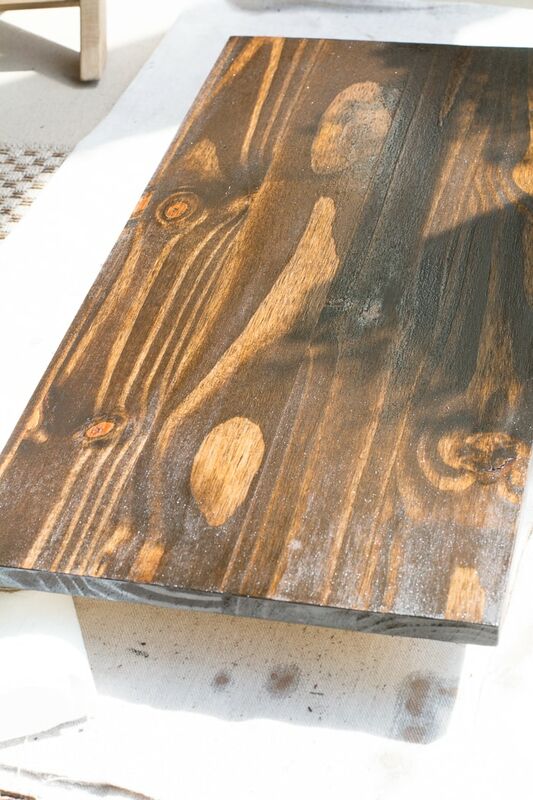 And yes, staining is a fantastic way to add character and warmth to your project! Can I use same process from going from a darker stain to a white stain. Have a piece I want to to change to a white washed look..your piece is beautiful!! Yes! 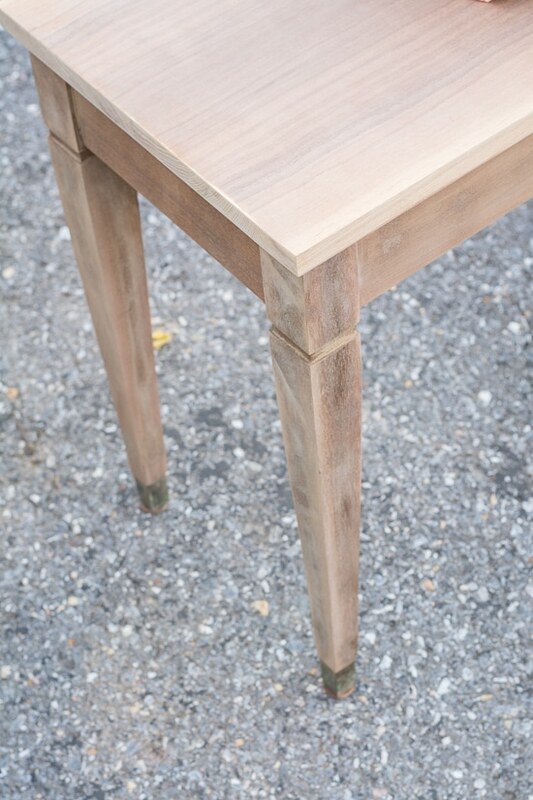 Just make sure the existing finish is totally sanded down to the bare wood!